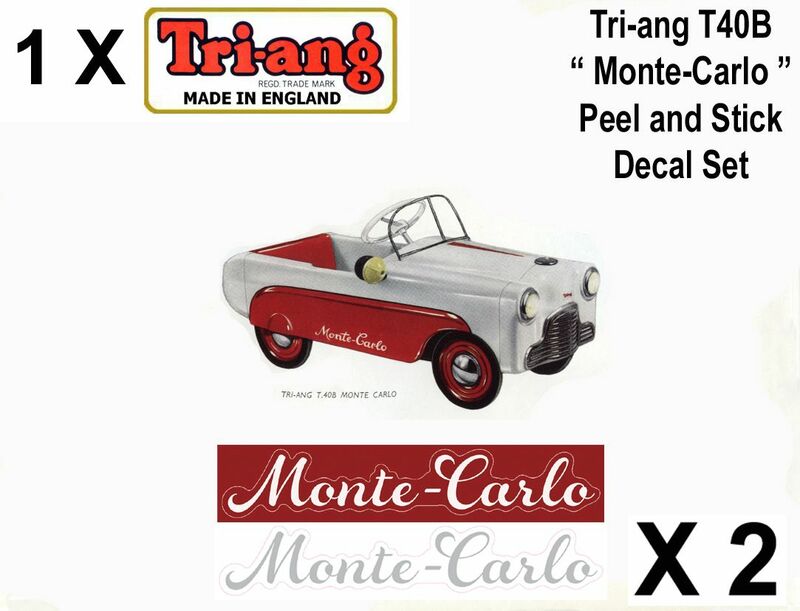 A set of 3 decals " Peel and stick " for the Tri-ang T40B " Thunderbolt " Pedal Car decals printed in White on "Clear material"
" Monte - Carlo "
ONLY THE LETTERS AND WHITE ARTWORK ARE PRINTED IN WHITE SO WHEN YOU APPLY THE ENTIRE DECAL THE RED OR WHICHEVER COLOUR YOU CHOSEN TO PAINT YOUR Monte-Carlo WILL SHOW THROUGH OUR CLEAR DECALS. This set of decals have been specially coated to ensure they are waterproof. We are pleased to announce that we are now producing our own laser cut adhesive decals for our Customer base Worldwide. We print in very high quality White Ink with superb multicolour range for the decals. All of our range will eventually be the same a clear background with only our artwork in Colour on a White background ( including White Ink printing ). When you receive your decals simply peel and stick! This eliminates the old fashioned cutting out and messy water application of White or Clear waterslide and laser printed decals papers . Some , not all of the range is ready but for those decal sets that are not they will all be done eventually and we are still happy to continue to supply in waterslide in the meantime. " Tri-ang our Dutch site " is our first priority for complete migration to this technology" Please ask if you require a Custom decal that we are not stocking regardless of it’s application or size.